The RoboBee, a millimeter-wide flying robot platform from Harvard’s Wyss Institute, has been gaining improvements for years. The latest trick of this diminutive robo-creature is to dive into the water, then emerge and blast itself upwards using a strange and clever mechanism for a safe landing nearby. The issue was that, while a robot may be able to fly in the air and swim in the water (as the RoboBee can), transitioning between them is the tricky part. At that size, the resistance of water on its lower parts is considerable, and can hamper takeoff (the robot already has to be careful not to flap too fast under water because the wings might break off). First, in order to get the robot past the surface tension of the water, another physical barrier we generally don’t need to worry about at our size, the team attached four little “buoyant outriggers” — floaties. These help bring it to the surface. But there, with only so much power coming from its tiny wings, the RoboBee may very easily find itself stranded. How could they create a single powerful upward impulse that gets it free and clear, where it can resume effective flapping? The solution arrived at by grad student Elizabeth Farrell Helbling, Yufeng Chen and the rest of the team was to use gas. Of course, a robot that can fit in a thimble can’t carry much. So why not make it on the fly, so to speak? 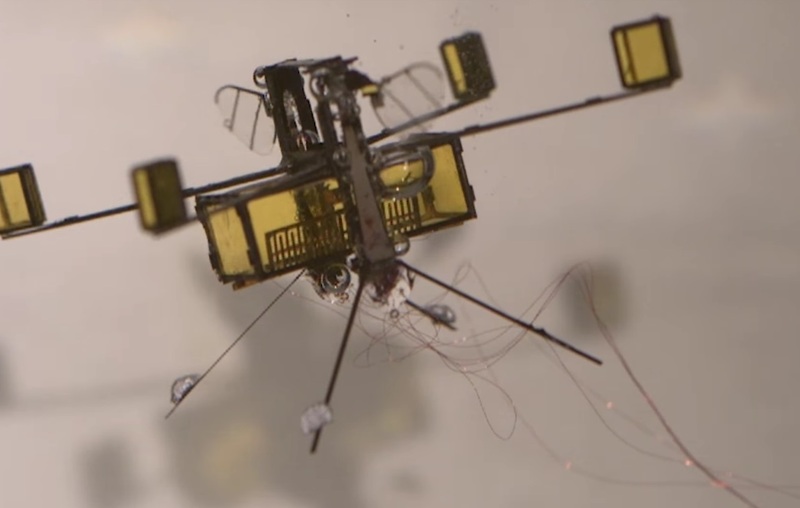 In addition to its little water wings, the RoboBee has a little electrolytic plate that splits water into hydrogen and oxygen, then mixes them together for an easily combustible mixture. Once there’s enough, a tiny spark plug fires off and the gas ignites, popping the robot up into the air! Free of the water, its wings can take over, and it can make a safe, controlled landing near the teacup or whatever it was imprisoned in. The whole thing, meanwhile, weighs a total of 175 milligrams — almost twice as heavy as previous designs (the floaties and so on add quite a bit of mass), but still incredibly small. Redesigns added to the platform’s potential payload, though, so the mass used by these water-specific items could also be used instead to deploy sensors or even a battery that would free it from its wired tether. “We hope that our work investigating tradeoffs like weight and surface tension can inspire future multi-functional microrobots – ones that can move on complex terrains and perform a variety of tasks,” said Chen in a Harvard news release.